When we were in the palace of Patwas [locally known as Patwo ki haveli] in Jaisalmer, there were things in big number that were picturesque and photogenic. I could have filled all the 3 of my memory cards if I had enough time. But still, what I painted on billions of bits of Boolean was satisfactory for me. 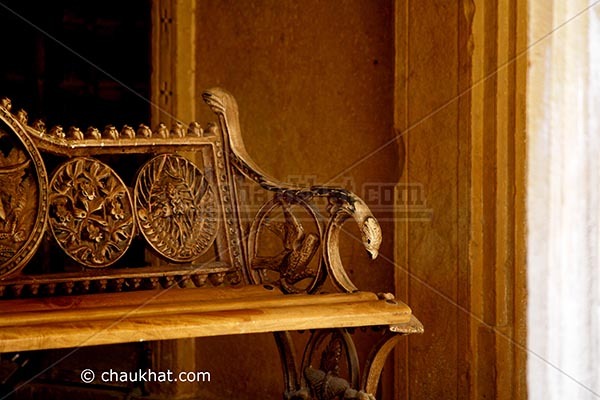 A few million of those lucky bits stored the following photo of an iron bench outdoor a section of the palace of Patwas. Do you like to be outdoor? Do you want to sit on this iron bench outdoor? Do you like this photo? My answer of course is yes for all the 3 questions :) I want to see your comments. To fully appreciate the depth and beauty of this old bench, I enlarged the photo. It is even more stunning up close. So to answer ... yes, I love the outdoors; yes I would probably spend hours sitting here on this bench (in the outdoors I love! ); and YES! I really like this photo! But you know I love ALL of your photos. You are an amazing photographer and writer, and I appreciate each of your posts! @ Clytie: I'm feeling so good reading such nice words from you. Thanks so much for appreciating my work. Comments like this one make my day, really! Beautiful gold colors. Restful on the eye. Thank you.